Tired of doing the scheduling dance? Start by adding your FreeBusy page to your email signature. If you're a fan of calendars you'll love our other product, MileLogr. MileLogr saves you money on taxes by automatically generating your deductible mileage log. 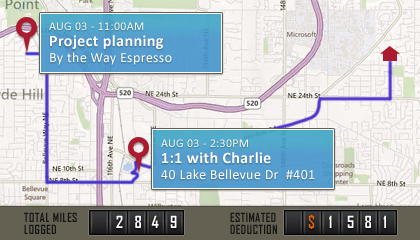 It can reconstruct your daily driving route from your calendar appointments, retroactively, as far back as you have data.